A man missed completing unpaid work for the community because he was already doing two jobs. Anthony Robinson,27, of Hockley Place, Grange Park, pleaded guilty to failing to comply with a community order. He was fined £100 and ordered to pay £60 costs. Cheryl Crawford, prosecuting for the probation service, said Robinson had been sentenced to a 12 months community order with 80 hours payback work for an offence of attempting to drive while unfit through drugs. He had missed work appointments on August 11 and 25. On one occasion Robinson had said he was ill and on the other that he started another job and could not do payback work on Saturdays. He had done 15 hours of the unpaid work and still had 65 hours to complete. Robinson told magistrates that he had two jobs one at a nightclub the other as a labourer. He also saw his children at the weekend. A man missed rehabilitation appointments because he did not have a permanent address and letters did not reach him. Dean Jeynes, 37, who gave a care of address of The Salvation Army, Raikes Parade, Blackpool, pleaded guilty to failing to comply with a court order. 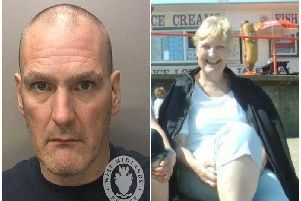 Cheryl Crawford, prosecuting for the probation service, said Jeynes had been sentenced to a 12 months community order with 25 days rehabilitation to be supervised by the probation service and a nine months drug rehabilitation requirement for an offence of possessing heroin. He had done no rehabilitation days and missed appointments on July 10 and 19. Mitch Sarangi, defending, said his client had told his probation officer he was basically homeless and sleeping on various friends sofas. Letters sent to him at his care of address had been returned to the probation service. Jeynes accepted he should have gone into the probation services office to see his officer about his drug rehabilitation requirement. A stag night reveller spat on a police officer’s head at Blackpool after he tried to steer him clear of a incident. Khya Scott, 26, of Chevil Rise, Wolverhampton, pleaded guilty to assault. He was fined £80 with £85 costs and ordered to pay £50 compensation to the officer plus £30 victims’ surcharge by Blackpool magistrates. A drunken car wash worker caused a fracas in a Poulton town centre shop. Claudiuadrian Olaru and his brother became annoyed after the shop assistant said she could not accept the £50 note they tried to pay with. Olaru, a 31-year-old Rumanian, of Borden Lane, Bradford, pleaded guilty to being drunk and disorderly. Prosecutor, Jim Mowbray, said police were called to Poulton’s Market Place convenience store on September 22 at 8pm where a shop assistant described Olaru and his brother as rude and abusive after she told them she could not accept a £50 note in payment. The officer tried to speak to Olaru, but he was unpredictable and rude and the officer had to get hold of him. Olaru’s brother then came up, tried to interfere and the officer had to push him away. Patrick Nelligan, defending, said Olaru and his brother had not understood why the shop assistant would not accept the legal tender of £50. The defendant’s brother went to change the note but Olaru said when he came back the assistant shouted at them to get out saying she would not serve them. A teenager accused of abducting a 15-year-girl at Blackpool failed to report to police. Anthony Innes, 18, of Mansfield Road, Layton, pleaded guilty to breaching a condition of his bail. Prosecutor, Jim Mowbray, said Innes had pleaded not guilty to child abduction and been bailed for a trial. Innes bail conditions included reporting at Blackpool’s new police headquarters on Saturdays and Tuesdays. On Saturday September 22 he failed to go to the police station and sign in. Patrick Nelligan, defending, said his client did not know a lot about the justice system and had not fully appreciated what happened when he previously appeared in court.